Got company coming for Thanksgiving? Wouldn't it be delightful to have these large Thanksgiving coffee mugs to greet them in the morning with their favorite java or hot apple cider? These make great gifts. 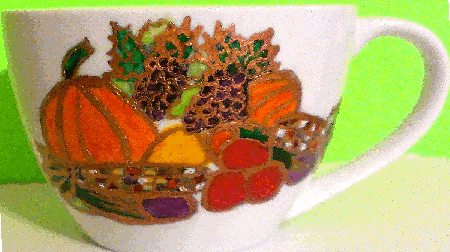 Fall, Autumn Harvest and Thanksgiving large coffee cups and mugs hand painted in the vibrant colors of the season with pumpkins, grapes, cabbages, pomegranates, Indian corn, apples, squash all etched in gold leaf. Clearly Susan has other pieces of Thanksgiving dinnerware hand painted to match.